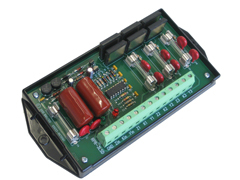 The RPR-3LD Repeating Pulse Relay is designed as a direct cross to the Sentry 30 relay with matching terminal arrangements to make it truly a form, fit and functional cross. It provides three isolated, solid-state, Form C (K, Y, & Z) dry contacts from one Form C input. It is designed to filter noise and transients from its input to prevent false pulses at its output. The RPR-3LD's robust solid-state switching devices are rated at 800V and 750mA giving maximum protection from lightning or transient voltage damage. Its built-in transient protection for the solid-state switch contact eliminates the need for external or off-board transient suppression devices. Update 1/6/14: The RPR-3LD is no longer available. You may still download spec sheets and installation instruction for the RPR-3LD in the Legacy section of our Documentation page. 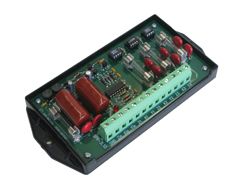 The SPR-3LD Repeating Pulse Relay is designed as a direct cross to the Sentry 30E relay with matching terminal arrangements. It provides three isolated, solid-state, Form C (K, Y, & Z) dry contacts from one Form C input. The SPR-3LD's input and output circuit's terminal strip connector is a "EURO" type providing excellent insulation. The "K" lead of the SPR-3LD's output is fused to prevent damage to the relay under almost any conditions a user might cause such as excessive current, incorrect wiring, etc. The SPR-3LD's robust solid-state switching devices are rated at 400V and 150mA giving maximum protection from lightning or transient voltage damage. Update 1/28/14: The SPR-3LD is no longer available. You may still download spec sheets and installation instruction for the RPR-3LD in the Legacy section of our Documentation page.